I tend to disregard swatches. In fact, I think I’ve made one swatch ever. 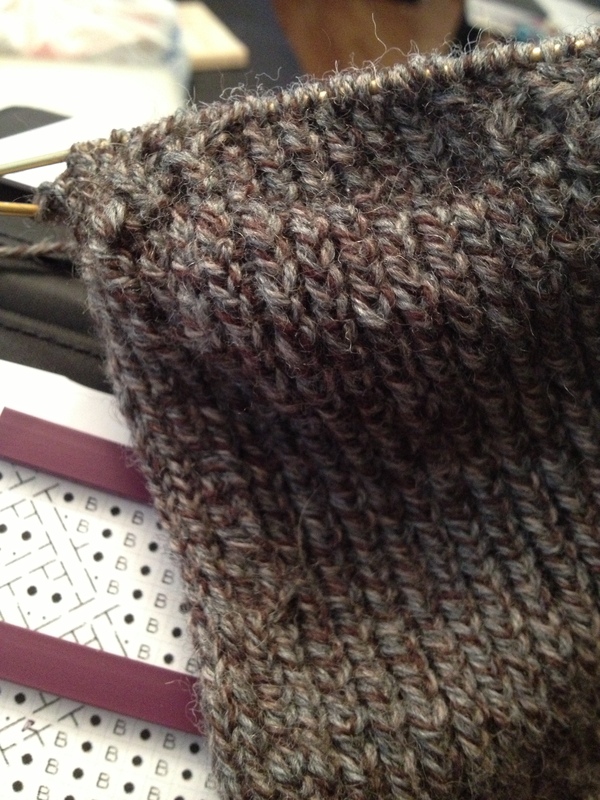 I’m not a huge fan of knitting stockinette flat, so it’s just not something I do. I learned yesterday just how important this particular knitting technique really is. Oh my goodness. Yesterday was an insane day. I spent most of the day and evening sick in bed. No good. Then, when I had managed to straighten myself up, I took a real good look at the sock I’ve spent over a week working on. Even worse. The yarn is lovely to work with, though not very soft. The big problem is the lack of stitch definition and the dark colour. None of my cables/twists were showing up at all. Of course, before noticing that, I also realized I had been purling when I was supposed to be kbl and vice versa. It’s a disaster. Well, that’s a bit dramatic. It is depressing, though. I almost could have lived with that. Almost. Then, for the first time since starting the project, I tried on the sock. It was already up over my heel and about to my ankle, and I hadn’t even done the heel turn. What was I thinking not doing a swatch? This sock … oh my goodness. If I had swatched, I would have realized that the yarn wasn’t going to have the brightness or definition I was looking for, as well as how big the stitches were going to turn out. Nevertheless, I made an executive, stressed-out decision and unraveled the sock. I still really like the pattern. It’s Tara – SKA March 2012 Mystery Sock by Janneke Maat. It’s a gorgeous sock, and I’m keeping it in my queue for several reasons. First of all, the techniques are fairly easy, even for such complicated looking cabling. Once I sat down, I completely understood what I was doing. Second, I think it’s just a poor yarn choice. This yarn was meant for some other sock, but somewhere out there is the perfect yarn for this project. Once I have it, I’ll totally try this one again … with smaller needles possibly. Will I mend my ways? Possibly. I don’t know when. And yes, I realize I’m a big quitter. Knitting is how I release all my tension and relax, so if I’m not happy with how a project’s turning out, I’m not going to continue with it unless it’s something I’ve promised someone else. What about you? Do you do swatches? I only ever do a swatch if its something that needs to fit, like a shirt or a hat. And then, you have to ask yourself “how much would I cry if I had to unravel this?” So a sock most definitely warrants a gauge swatch! Next time, I’m sure you’ll have a gorgeous, well fitting sock. I completely understand your frustration with not wanting to swatch. I used to think the same way, even knowing that I knit big, but I’d say to myself “well, I’ll just compensate beforehand by going down a couple needle sizes.” Because I made cardigan and such, I (kinda) got away with that. Well, the last big knit project I made was a long-sleeved sweater for my fiance (who had a runner’s lean build). I finished it, and it was big enough for both he and I to wear–at the same time! So now he only wears it around the house, when it was supposed to be a really nice, form-fitting sweater. I’ve learned my lesson the REALLY hard way–next time, I’ll be swatching! I hate making swatches, so I only do it if it is absolutely necessary, like something that has to fit just right. I’ve never made a swatch for socks though. I don’t recall ever swatching, and yes, there have been a few dodgy fitting garments! I’m just trying to bring myself to unravel the first 12inches of a beautiful shawl, it’s intricate, and looks fabulous blocked (in the book) but it’s just not doing it for me, right there on the needles. I’ve seen a gorgeous picture on the Mason Dixon blog – all grey and reversible cables on tiny needles which I reckon I can make a version of. Yep any minute now….. I recently was faced with a shawl project like that. I loved the picture, but it just wasn’t working for me. It’s tough after all that work!